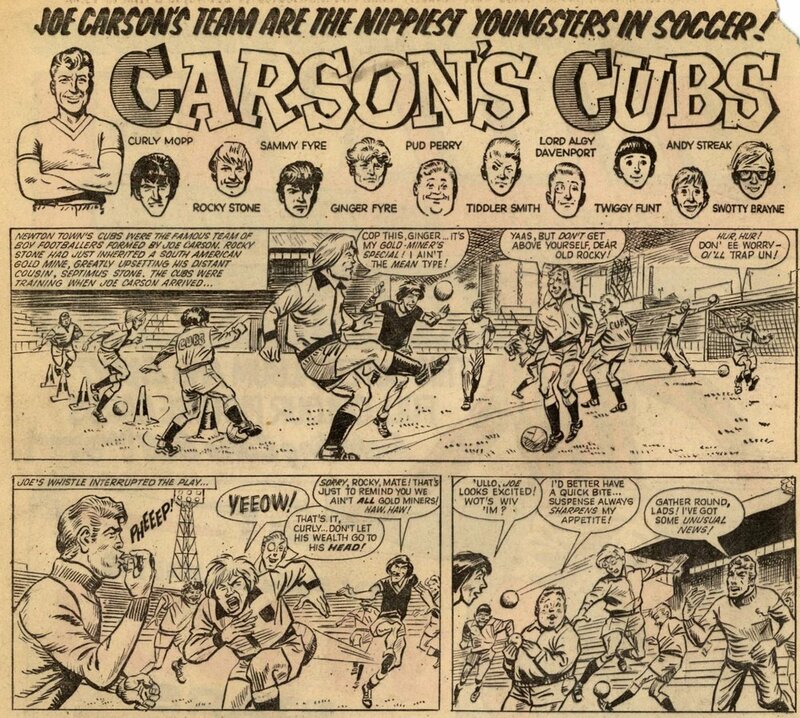 As promotions went, this was one of IPC comics' largest and most complicated. 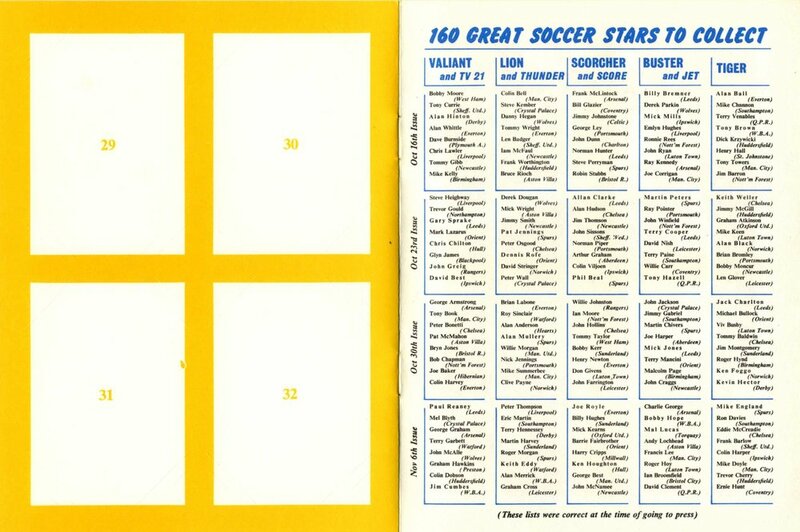 Over the course of four weeks, starting with these issues cover-dated 16 October 1971, 160 different football cards were given away, to be collected into five mini-albums. 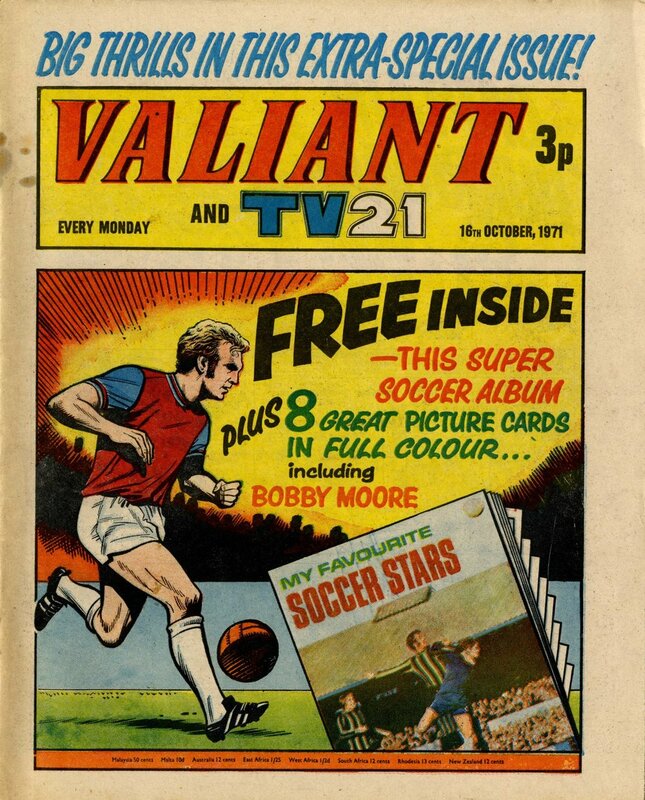 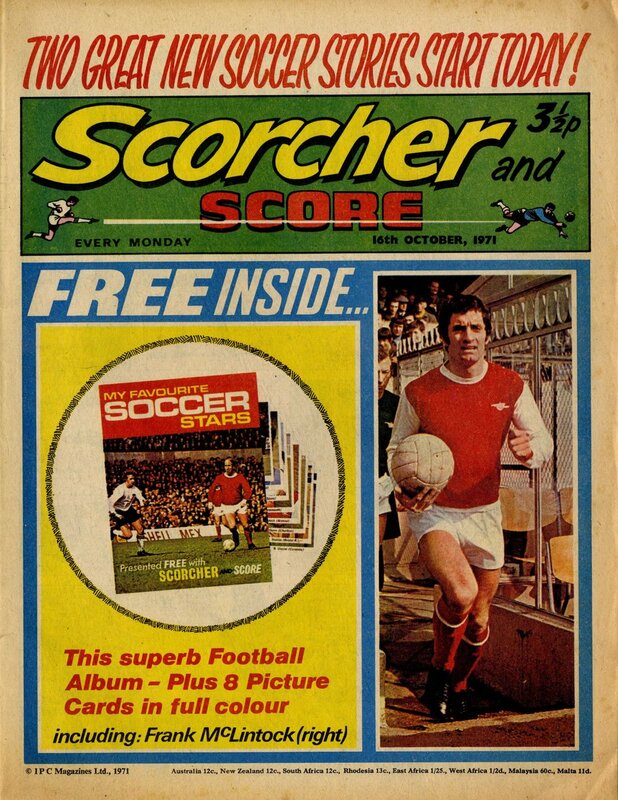 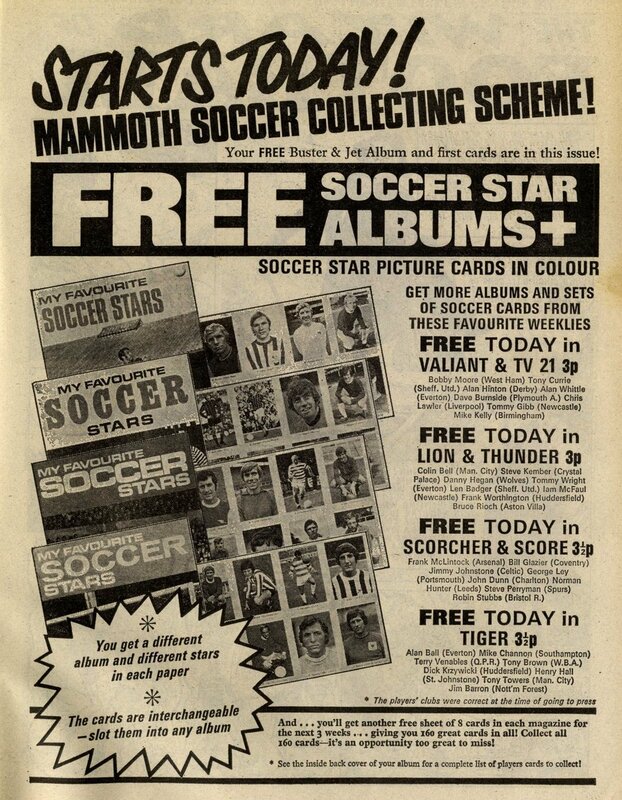 The giveaway was spread across five titles – Buster and Jet, Valiant and TV21, Lion and Thunder, Scorcher and Score and Tiger and Jag – which meant an outlay beyond the bounds of most weekly pocket money accounts for those completists who wished to collect the full sets (i.e. 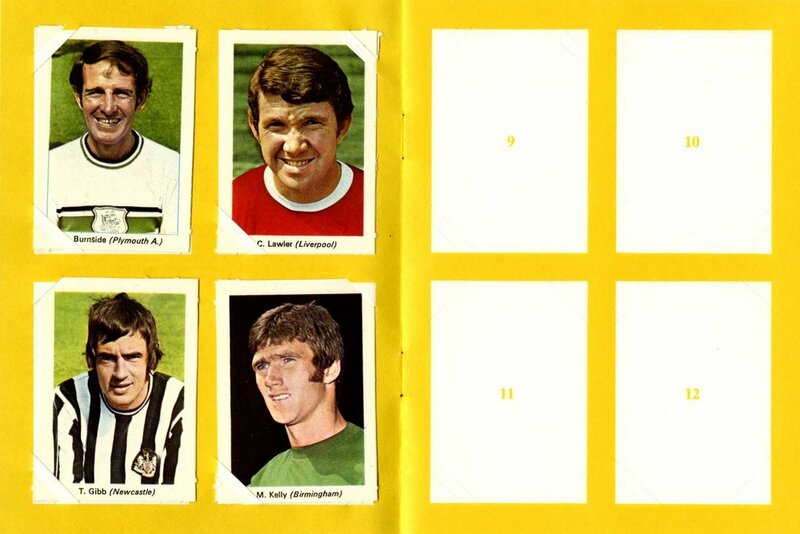 just about everybody). 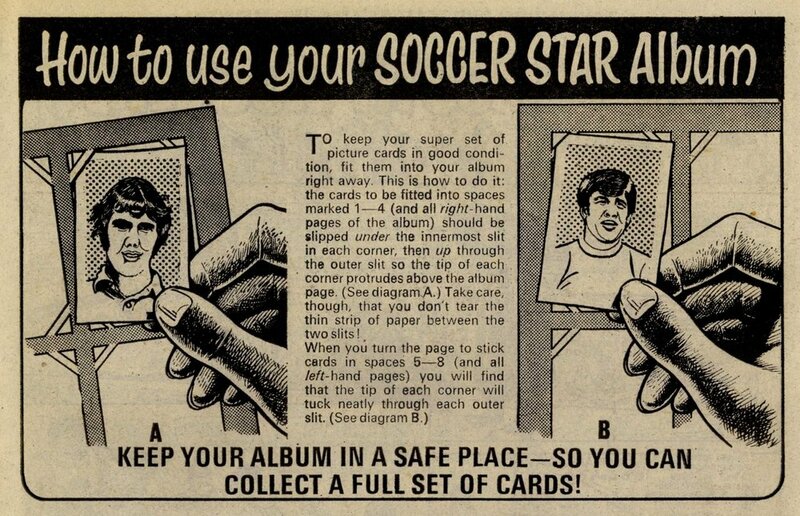 It was an ambitious scheme, and fascinating to look back on now, not only for a glimpse of the stars of yesterday in traditional awkward photo-call pose, but also to see how football was presented in the comics of the day. 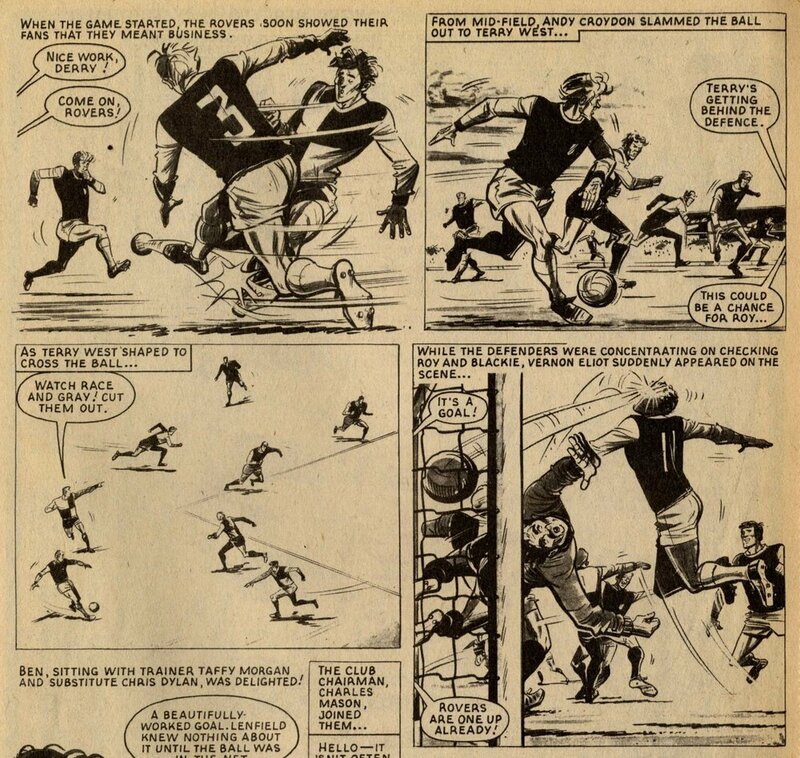 This was five years prior to the launch of Roy of the Rovers’ own comic, and a period in which comics started to attempt a more realistic dramatisation of football at both professional and amateur or schoolboy levels. 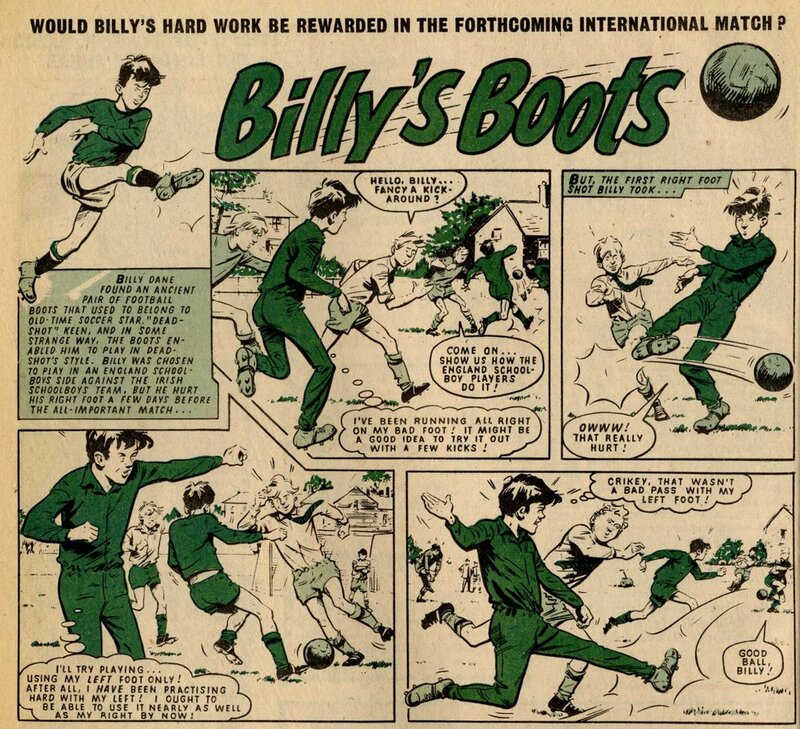 Roy’s adventures in Tiger were accompanied by the exploits of the Football Family Robinson (a professional team comprised entirely of members of one family), while in Scorcher, the magical tale of Billy’s Boots sat alongside a number of other unlikely tales including two which debuted in this week’s issue – Spy Between the Sticks and Brainy’s Bombers. 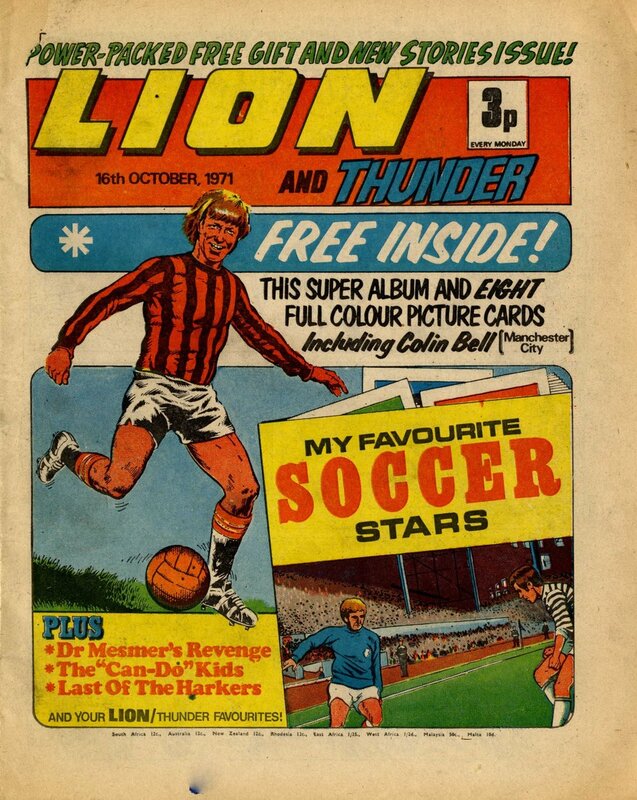 Valiant, Lion and Buster were more general adventure story papers , each of which contained an entertaining but improbable footy yarn: Raven on the Wing in Valiant (this week ranting about ‘naggedly females’), Carson’s Cubs in Lion, and The Wizard of Football in Buster. 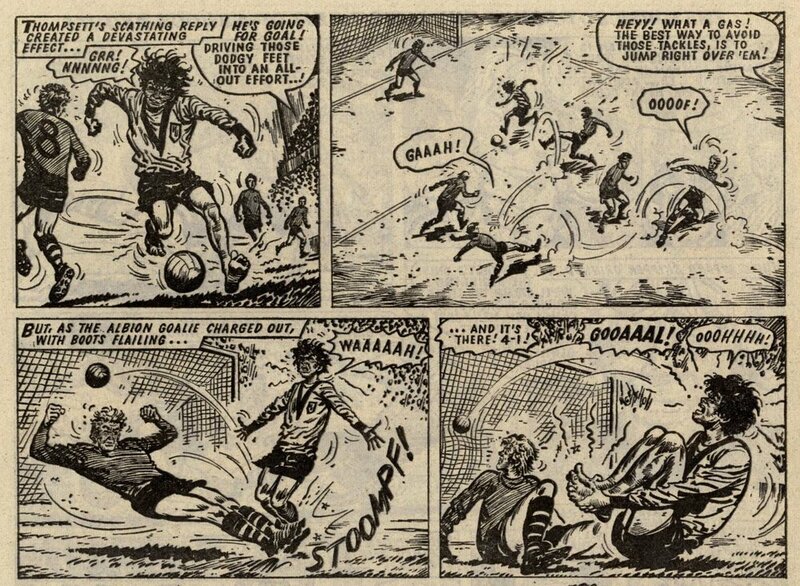 As a fun bonus, this week’s Buster also includes a soccer-themed episode of Von Hoffman’s Invasion (possibly because of the cards promotion) in which the revived Nazi boffin plots to interfere with the result of a forthcoming England v Germany international game. 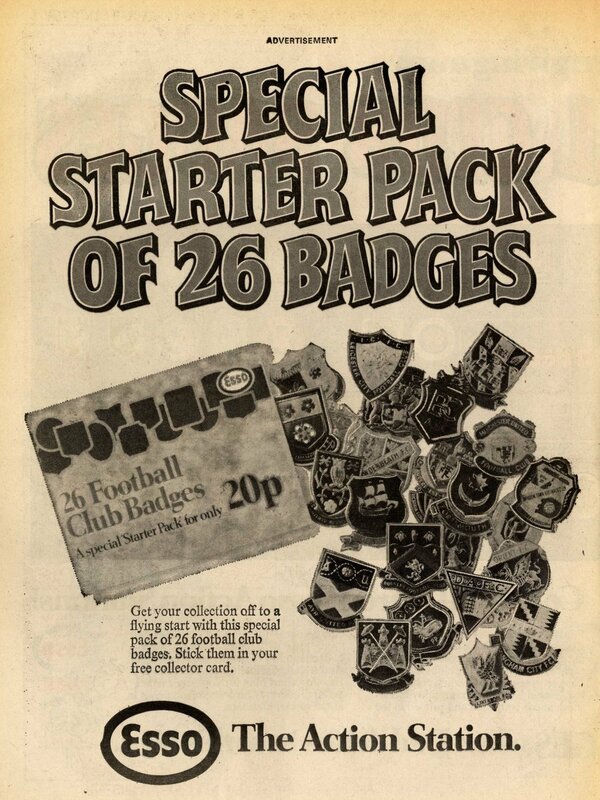 Adding to the football fever of these issues was a lovely four-page advertising pull-out in the centre of Buster, featuring Esso’s exciting club badge promotion. 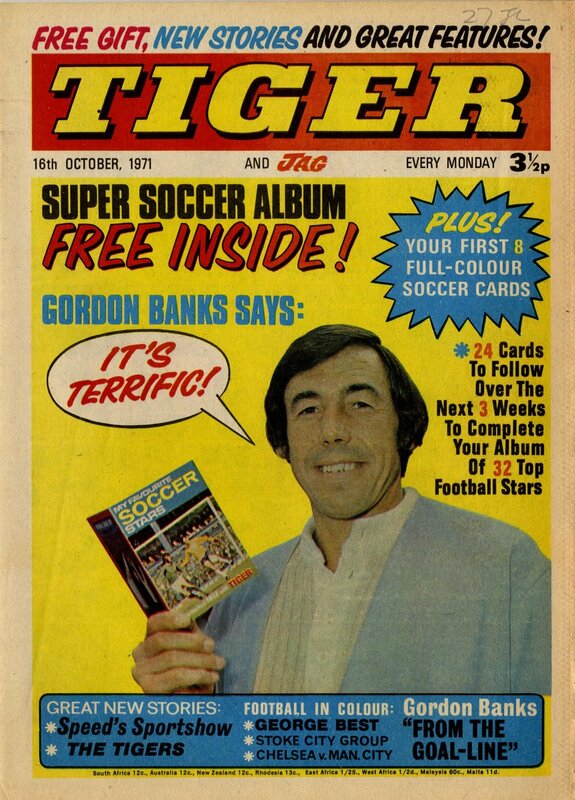 Exciting days!